An interesting early morning structure fire during the late 1940s occurred at a tiny pub called the Jungle Inn Bar located in Briny Breezes. The inn was a popular drinkery owned and op…erated by a man called “Biggin” Baskin — aptly named due to his mountainous size. The fire began as an unattended barbeque pit that was used inside the tavern collapsed in the wee hours of the morning, sending smoldering coals crashing to the ground. The unabated embers ignited the wooden floorboards and flames quickly rolled up the walls. The department had recently purchased a 1946 Mack 500 GPM piston pumper and Boynton firemen responded to the blaze with the new engine. On arrival, they found the inn totally insulted by fire. 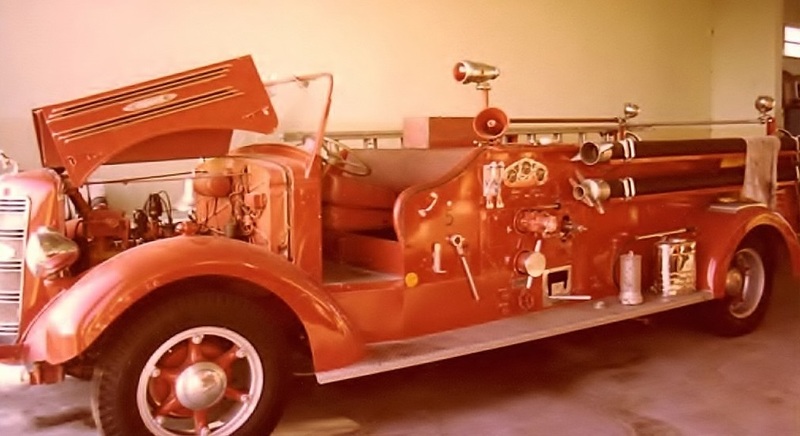 They staged the fire engine parallel to the tangled mangroves and Intracoastal Waterway (ICW) in hopes of drafting water, as hydrants were few, or non existent. In the chaos that ensued, the weary operator engineer [driver] stood aghast at the pump panel. Scratching his head in disbelief, he had forgotten the sequence for pumping. Fireman James I. Lacey then stepped up to the panel and quickly engaged the pump. As other firemen began to pull multiple sections of hose and nozzles from the engine, James deployed the hard suction, complete with strainer into the saltwater, thus beginning the drafting process. They valiantly battled the blaze until dawn. 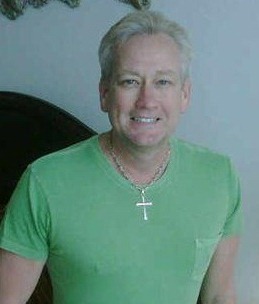 Michael Landress is a native Floridian and novice historian. He has spent the previous 15 years as a professional firefighter/paramedic for the City of Boynton Beach Fire Rescue Department. He holds a BA from St. Thomas University in Miami, Florida and his hobbies include; spending time with his two teenage sons, writing, photography, supporting the Miami Dolphins and saltwater fishing. 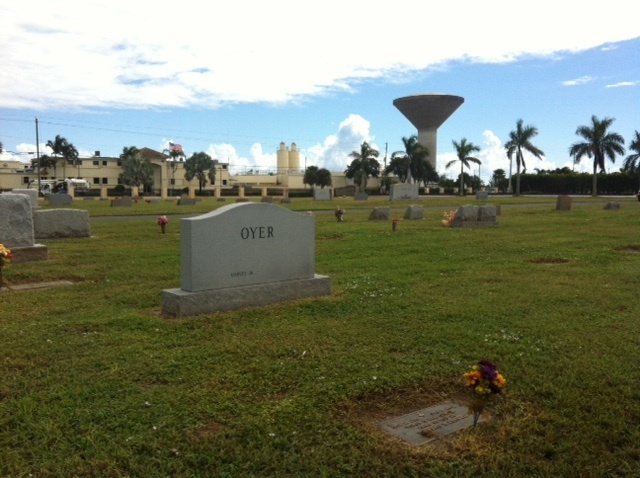 This cemetery is located on the southwest corner of Woolbright Road and Seacrest Blvd. The red X indicates the approximate location of Albert P. Bowens marker. Boynton Memorial Park and Mausoleum, Ca. 2013. 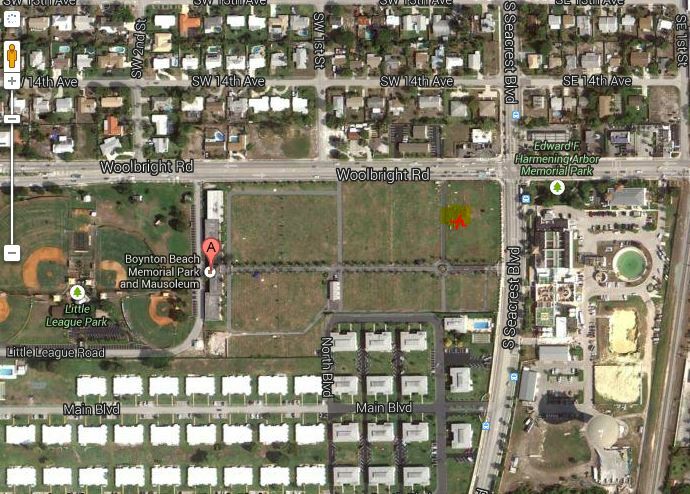 For nearly 20 years, I lived almost directly across the street from Boynton Memorial Park and Mausoleum, commonly called the Boynton Cemetery. The cemetery is the resting place for a number of my family members. I visit there fairly often, and find myself drawn to the old section. Due to my ties to the community, the Boynton Beach Historical Society, and my propensity for historical research, many of the old family names greet me like old friends. At some point, I found myself especially drawn to a rather lovely marker engraved with the name Albert J. Bowen. The dates on the monument indicate Bowen was born in 1865 and died in 1903. It dawned on me that his may be the earliest recorded death in this cemetery. 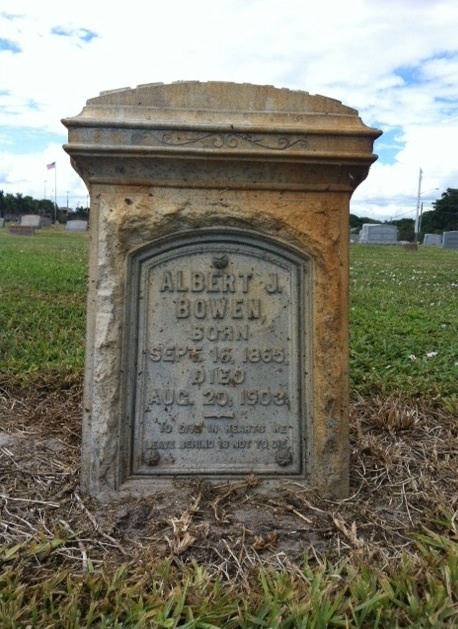 Sure enough, according to Palm Beach County genealogist Marjorie Watts Nelson, Albert Bowen’s 1903 tombstone is the earliest legible marker in the cemetery. When I realized this Boynton pioneer had lived less than 38 full years, I couldn’t help but wonder who this man had been and why his life had been cut short. What I found shocked and rocked me to the core! Poor Mr. Bowen suffered from a poisoning, a lethal poisoning! Born in Ontario, Canada, in 1865 to Thomas Bowen and Tabitha Filmore Bowen, Albert J. was the fourth of six children, all boys. In 1878, the family immigrated to northern Michigan, where Albert J. Bowen and several of his brothers worked on the river as log drivers. When he was 26 years old, Albert married Flora B. Ackley, then age 16, in Sheridan, Michigan. Flora was the daughter of George W. Ackley and Lucy Hall. According to the news article, Albert Bowen had worked hard all day in the fields, planting pineapple slips and came home tired and achy. He took some medicine and what he thought was quinine. Shortly after supper, he retired to his bedroom. Another boarder heard a disturbance and upon investigation found Bowen writhing in agony, screaming and convulsing. Joseph Freedlund went to West Palm Beach on the first train out and summoned Dr. Merrill, who rode back in a carriage driven by Richard Gardner, only to find Bowen’s soul had long left his body. His heart-broken wife and neighbors said Bowen made a mistake and took strychnine instead of quinine. After the tragedy, Flora and the children, who were only nine and sixteen years old, must have left town. Losing Albert and staying in Boynton likely was too much to bear. The 1910 census shows Flora, Rosa and Ruth living with relatives in Pennsylvania. In 1917, 40 year-old Flora (occupation listed as dressmaker) married Ivan E. Smith, four years her junior, in Flint, Michigan. By then Flora and Alberts’ daughters would be grown women, probably with families of their own. Albert Bowen’s headstone is engraved with the following words: “To Live in Hearts We Leave Behind is Not to Die.” At first I wondered why I was drawn to this marker and was compelled to research Albert Bowen 110 years after his death. I needed to tell his story, to make sure he is not forgotten. 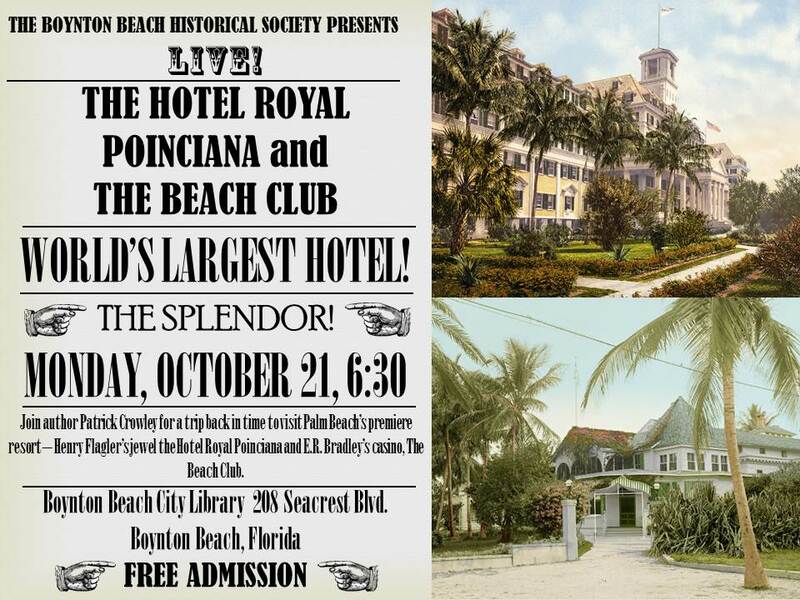 I am very excited about the Society’s October 21 presentation by Patrick Crowley on the Hotel Royal Poinciana and The Beach Club. The Hotel Royal Poinciana was once the world’s largest wooden building. We can’t even imagine the immense nature of the place, with miles of hallways, reeking of diamonds and money. It is with no doubt the most transforming structure ever built in Palm Beach County, bring us from swamp to splendor in a few short years. The wealthy northern scions even brought their own train cars along, parked on the property, so that not even a moment was spent with the common folk on open train lines. They stayed that ever so short season from January through March, enjoying the ocean beach, the coconut palms, the balmy air, the concerts – and the gambling over at The Beach Club! How they spent all those hours will be revealed – no television or movies to idle away the hours, just reading, conversing, strolling, eating, listening and dancing. So if you have Monday, October 21 at 6:30 PM open on your calendar, do stop by the Boynton Beach City Library and be swept back in time to that glorious era of American history.